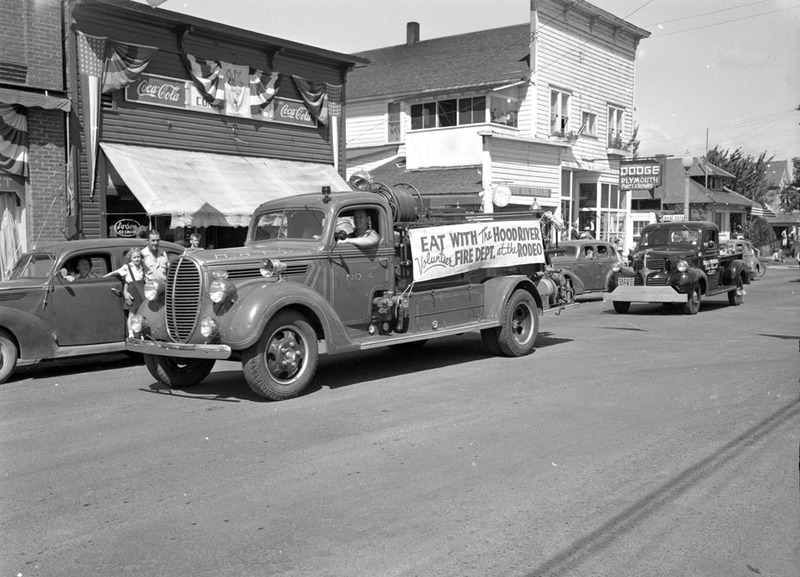 I believe this is the July 4th parade of 1947. The fire department is advertising its role providing food at the upcoming Hood River Rodeo. Do you recognize the location? Is that the Paddock building? Was the rodeo grounds down Belmont to Country Club Rd? Looks like the west side of 12th & Pine, Coke signs must be on the old Barcleys Drug store, the building currently being remodeled on 12th & Taylor on the far right, the large white building with the false front was a hardware store when I was growing up in the fifties, looks like it is the parts house for the dealership across the street in this photo, nice shot of the street light for the Uptown business district, use to be rings on the sidewalk to tie up your horse near several of these locations. I seem to remember a Hickey's food store in that general area...did home deliverys, ran tabs, etc. My grandparents, John H. and Ella, were regular customers as I believe that neither drove an automobile. Yes, the rodeo grounds were out that way Jim. I think the brick building that you can barely see on the left of the picture is Hickey's Market. And you didn't have to go to Hickey's to get your groceries--they would deliver them. I was their delivery boy the summer of 1958. The store with the Coca Cola sign was Stewart's before it was Barclay's. The hardware store was Volstorff's. Les and Chuck Sherwood had a real estate office between the drug store and hardward store. And Hickey's Market! Mr. Hickey always gave my brother and me a stick of pepperoni to eat while our mother was shopping. The market delivered groceries--what a treat that must have been! Mr. Hickey was such a nice man to our family... Does anyone remember the year 12th Street became one-way? mid eighties is a close as I could put the one way, Sue. That little building between Volstorff's and Stewart's--was it ever Cate's Auto Repair? I seem to remember a very dark interior and lifts for cars. Barbara, I only remember it as Les and Chuck Sherwood's business. The more I think about it I think it was insurance not real estate. I think Jacque's Grocery on Oak St. also delivered groceries. H. W. Chapman, the merchant on the hill, will commence the erection of a brick block next to Gill’s store this week. This will be the first brick building to be built on the hill with the exception of the new high school.